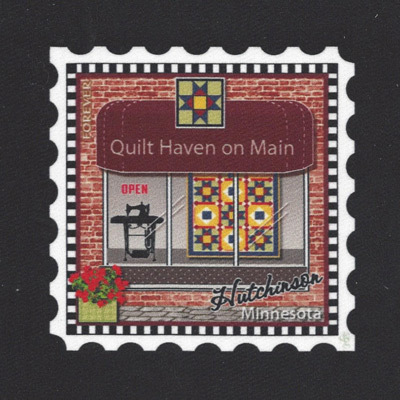 Quilt Haven on Main is a brick and mortar quilt shop located in downtown Hutchinson, Minnesota. The shop itself is filled with nearly every thing you can imagine related to quilting. There are thousands of bolts of fabrics organized with the utmost perfection. We have fabrics from the likes of Andover, Benartex, Henry Glass, Alexander Henry, Hoffman (Batiks), Marcus Brothers, Moda, Northcott, P & B, Riley Blake, RJR (Thimbleberries), Robert Kaufman, Ruffle Fabric, Maywood Woolies, Mary Flanagan Woolens, Primitive Gatherings, Weeks Dye Works and more. We also offer fat quarters. The shop has a pattern wall that contains hundreds of quilt patterns for quilts, totes, table runners, children’s clothing and more. Want to read up on quilting? We have you covered with bookshelves stocked with traditional and modern authors like Kim Diehl, Darlene Zimmerman, Gudrun Erla, Edyta Sitar, Weeks Ringle & Bill Kerr,Atkinson Patterns, Thimbleberries and More! Quilt Haven on Main also offers notions and a wide variety quilting books. Our notion wall has over 100 different products to make your next quilting project a success. We have multiple types of scissors, including perfect scissors for those with larger fingers. On the wall, you will find most of your basic quilting supplies. We also sell unique products like the Beam N Read—a hands free light, and the Sensational Sip & Snip—a metal frame which holds your beverage and your scraps. Looking for a unique home decoration or gift? Our shop is also stocked with many great gift items for decorating your home or gifting. You find items small and large to help enhance your space! These gift items change on a seasonal basis. In addition to all of the quilting products we sell in our shop, we also host many different classes, clubs and events throughout the year. It seems like there is always something going on at Quilt Haven on Main. We offer classes and clubs for all levels of experience. 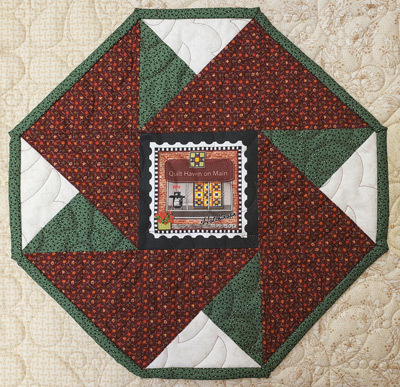 For more information about upcoming quilt classes click here. For more information about upcoming quilting clubs, click here. For more information about upcoming events at Quilt Haven on Main, click here. We recently launched an online shop on this website. At this time, we aren’t selling our complete inventory online. We are selling a selection of our popular quilt kits, which you can view here. We are also selling a selection of our completed or finished quilts. These are quilts we have made up as samples. You can view the completed quilts for sale here.